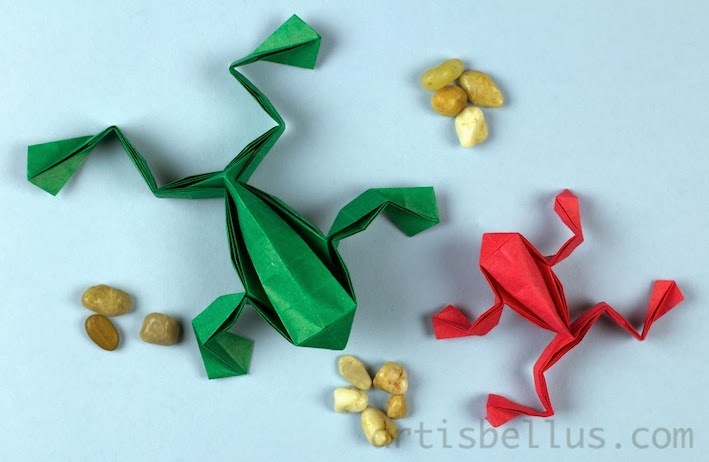 These funny origami frogs were designed by Toshikazu Kawasaki, using the box pleating style. 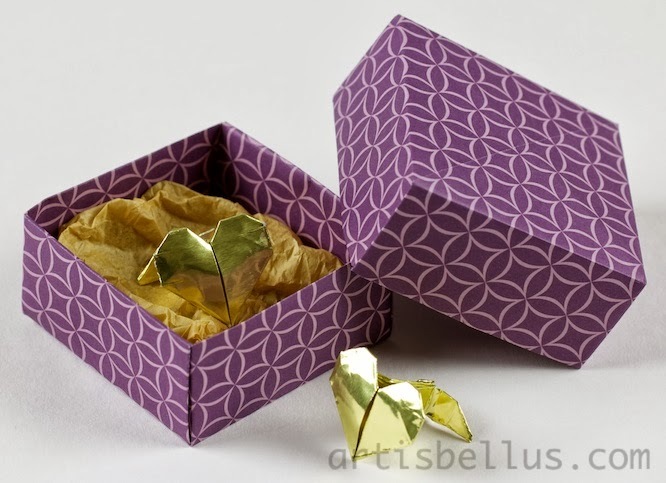 According to the definition in the Origami USA glossary, "box pleating is a style of folding characterized by all folds running at multiples of 45˚, with the majority running at multiples of 0˚ and 90˚ on a regular grid". It usually means that you have to start by pre-creasing a grid, and then collapse. The instructions to fold the frogs can be found in the book Origami Dream World - Flowers and Animals , by Toshikazu Kawasaki. I used a green 9" (225mm) square of Pacon Paper , and a 6" (150 mm) square of red thin washi paper. This is a simple and elegant model by Toshikazu Kawasaki. 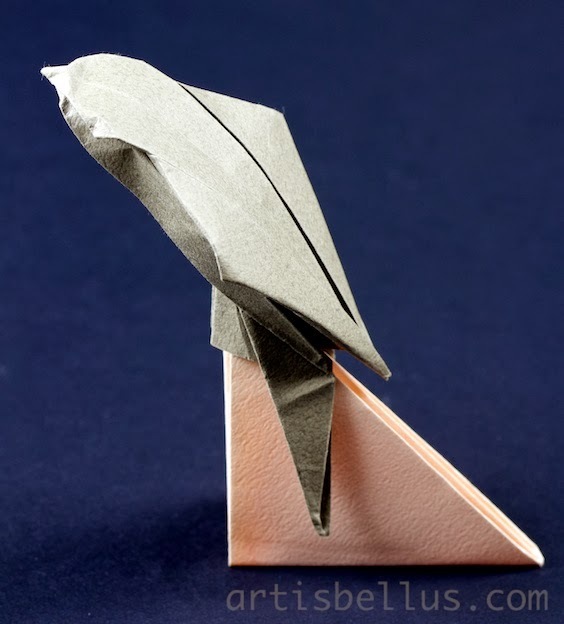 The instructions to fold the swallow can be found in the book Origami Dream World - Flowers and Animals , by Toshikazu Kawasaki. I folded the model with two 6" (150 mm) squares of Japanese Tant Origami Paper (one for the bird and another one for the stand). It's always a challenge to find romantic gifts "for him". But what about this Heart Cufflinks? They are a great choice for Valentine's Day, and for the first wedding anniversary (or paper anniversary). You can gift-wrap the cufflinks with a Masu box, which is simple and elegant. The Heart Cufflinks were designed by Francis Ow. The instructions can be found in the ebook, Love Origami Convention Book 2008. 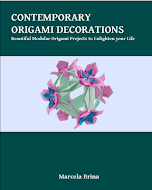 Click on the title of the book to download it for free from Origami-Shop. The masu box is a traditional model. You can find video instructions for the masu box here. Each cufflink is folded with one 2" (50mm) square of double sided gold paper. The masu box is folded with two 6"(150 mm) squares of scrapbook paper. I also added a piece of wrinkled golden tissue inside the base of the box. Flowers are a one of the most popular gifts for Valentine's Day. 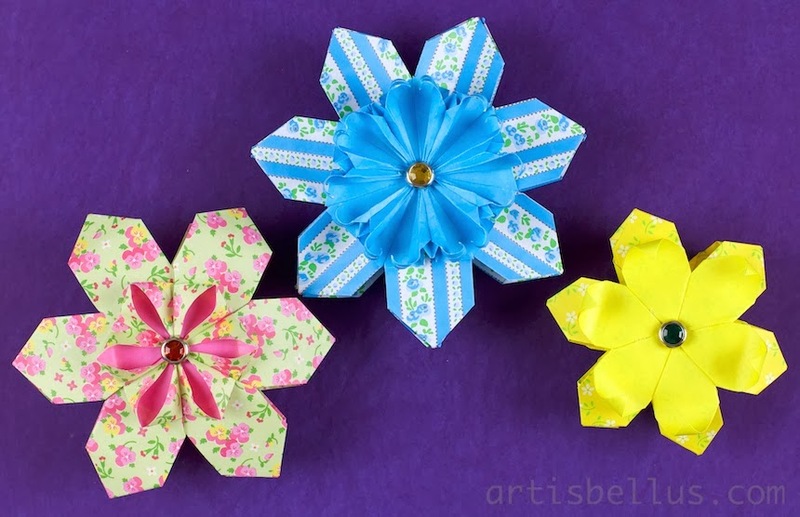 Here are some gorgeous origami flowers that you can give as presents. 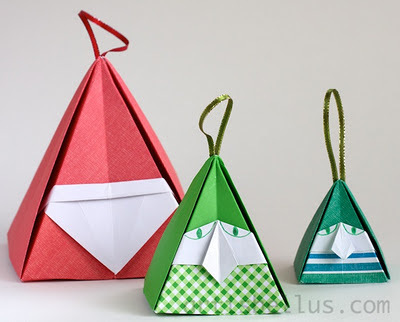 They are very easy to fold, and they will last longer than real ones!. Florucha (pink and green, on the left), designed by Isa Klein. The instructions are available in her site Diagramas & Cia. I folded it with six 2"x 6" (50 mm x 150 mm) rectangles of duo origami paper. Flora Flor (light blue and white, on the center), designed by Flaviane Koti. The instructions are available in the book Origami em Flor , by Flaviane Koti and Vera Young. I folded it with seven 2"x 6" (50 mm x 150 mm) rectangles of duo origami paper. Layered Poinsettia (yellow, on the right), designed by Meenakshi Mukerji. The instructions are available in her book Ornamental Origami . I folded it with six 1½"x 6" (38 mm x 150 mm) rectangles of duo origami paper.